Lovely 1 bedroom 1 bath top floor, corner unit overlooking pool and clubhouse. Ocean view balcony with breathtaking views of the white sandy beach. Ocean view living room with TV, DVD/VCR. Ocean view, fully equipped kitchen and dining room with seating for 4. Ocean view bedroom with 2 queens and TV/VCR. Full bath with tub/shower. Bonus room with bunk beds. W/D located on each floor. Wireless internet access. Beach chairs and boogies boards available for use. The Hacienda del Sol I is a five story ocean front condo on the beautiful car free beach of New Smyrna. Enjoy the sunset on your own private balcony or collect sea shells along the oceanside. Families will enjoy the great pool deck with oceanfront pool, kiddie pool, shuffle board courts, gas bar-b-que grills and clubhouse. Laundry facilities are located on each floor and are coined operated. Some units do have washer/dryers inside the unit. Walk right across the street to shopping and dining. - Laundry facility located on each floor. Ocean Properties Vacation Rentals, Inc.
About Ocean Properties Vacation Rentals, Inc. 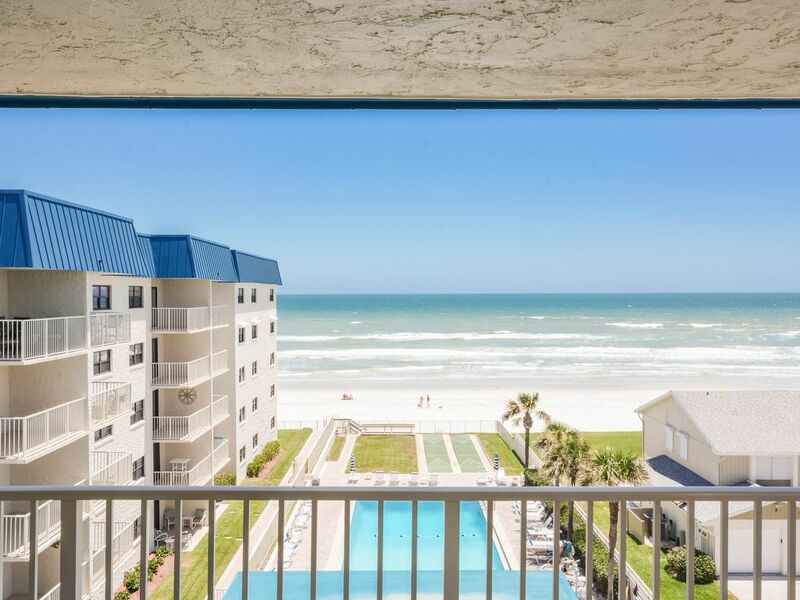 Ocean Properties Vacation Rentals, Inc. has been accommodating those looking to experience the New Smyrna Beach lifestyle since 1986. We are proud to be the largest independent, family owned and operated property management firm in the New Smyrna Beach area. Our company features the finest vacation rentals, each capturing the beauty, magic and fun to make your vacation one you'll remember for a lifetime. Ocean Properties Vacation Rentals, Inc. provides a great selection of homes and condos, available daily, weekly or monthly that can serve the needs of all budgets and tastes. View more about Ocean Properties Vacation Rentals, Inc. Grounds were nice but the condo could be cleaner. Carpet needs to be cleaned. Ceilings need to be vacuumed. Thank you for your feedback. We will certainly address these issues. We do hope that you enjoyed your stay and we hope to see you again in the near future.